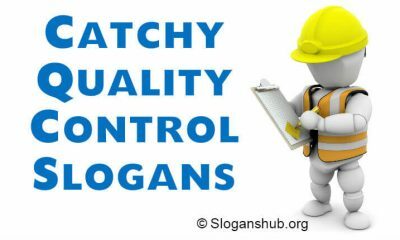 In this post you will find 55 Catchy Ozone Slogans and Taglines. 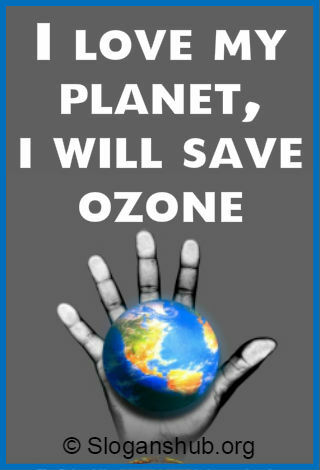 Save ozone, our planet’s safe zone. Deal to day with Ozone for Batter tomorrow. Ozone, sit tight, coz now we’re on a fight. If you don’t know how to fix it, please, stop breaking it. Mr. Ozone, we won’t let you down. 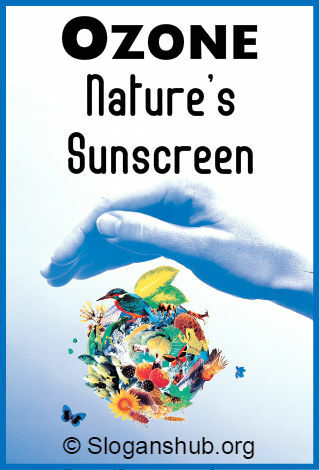 Prevent skin cancer – Protect the ozone layer! 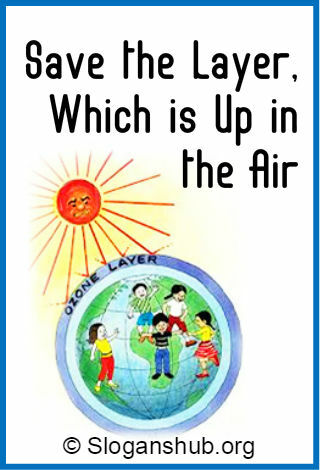 Save the layer, which is Up in the air. Don’t let the O-zone layer become the Oh-No-zone layer. Save our souls, protect the holes! Save the planet, save ozone. Ozone Layer: A hole in one can ruin your day. Ozone is risky to well-being yet layer is sturdy. 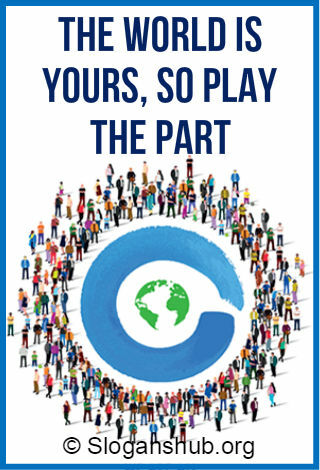 The world is yours, so play the part. 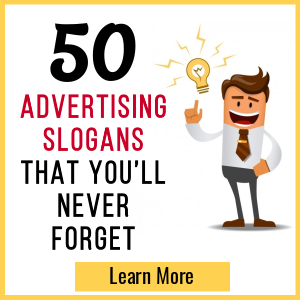 Lose it and you’ll never find it again. Ozone is the world’s best friend. Save the ozone layer or give heat to your next generation. Ozone Layer Destroyed = There is no clear Skies. I love my planet, I will save ozone. Ban pollution, ozone is precious. Ozone to – day Oxygen tomorrow. Say no to the ozone hole! Protect the ozone layer for it protects us. Ozone Layer the UV Blocker. 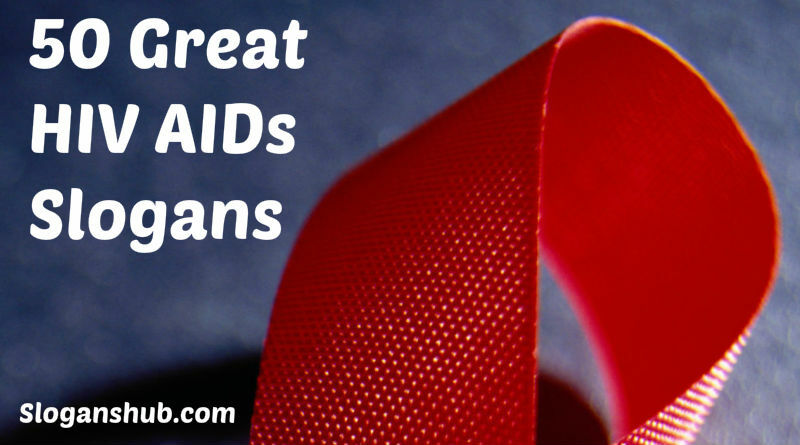 Leave the ozone and it will let you live. Save earth today to survive tomorrow. Ozone is harmful to health but layer is good. Vote for controlling gases harmful to Ozone layer. Regulate gasses that harm Ozone layer. Earth without ozone is like a house without roof. 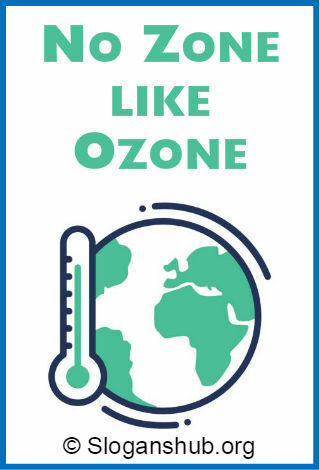 Preserve Ozone layer it protects us. Ozone-not just a layer but a protector. Ozone or nozone… choice is yours. Be chill and don’t fill the earth with heat. Preserve ozone today it will protect us tomorrow. Keep the Ozone from becoming the NO zone. There is no zone when we pollute ozone. Save ozone layer else you may lie in no zone. Ozone and Carbon Monoxide makes Carbon Dioxide and Oxygen. Keep calm & fight for Ozone layer. The first step in repairing our planet starts with the outer layer, Ozone.